I am thrilled that Wayne and Gerardine Hemingway have asked me to organise a Tupperware party as part of their Vintage at Southbank festival. For the weekend of 29 to 31 July, London's Royal Festival Hall will be transformed into a warren of venues and performance spaces, to celebrate and showcase British style and design of the the last seven decades. There is an amazing programme of music, films, performances, events, workshops, food and drink, and more; and there will be a vintage marketplace outside the RFH, which is open to all. I will not, as you might expect, be in the marketplace. The Hemingways have instead asked me to create a retro kitchen set inside the ticketed area of the Royal Festival Hall, into which I will invite festival punters to join me and my hostess at a Tupperware party that celebrates fifty years of Tupperware as a classic piece of domestic product design. Very exciting, and quite daunting, but I am delighted and excited to be involved. 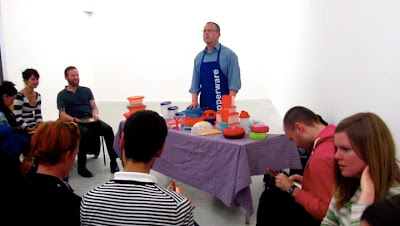 This is not the first time that my Tupperware parties have collided with the world of art and performance. 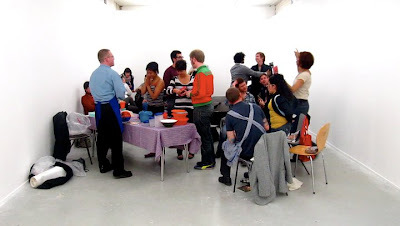 In September 2008, I blogged about a Tupperware party hosted by bearded drag queen Miss Timberlina at a London Fashion Week party, in a beach hut decorated by Alesha Dixon. Then at the 2009 Edinburgh Fringe Festival, I supplied Tupperware products and after-show sales for US Tupperware queen Dixie Longate. Sadly, my blog was on hiatus at that time, so there are no photos or reports from Dixie's show, but if she makes it back to the UK for more shows, I will be at her beck and call and will blog it all. One performance for which I was actually paid as an artiste was Gay Shame Goes Girly, an event organised by the Duckie collective in 2009 as a tongue-in-cheek alternative to London's Gay Pride. A celebration of all things female, or matters perceived to be culturally female or feminine, I was brought in to do Tupperware Lady training. I prowled the event in my Tupperware pinny, with a tottering tower of Tupperware all Velcro-ed together, looking for likely recruits, of any gender. I used the official Tupperware training manual to ensure that each potential Lady had clean nails, had their hair off their face, and that they could do a decent product demonstration to their friends. Successful candidates became part of my sales force for the evening, for which I gave them a business card and a complimentary piece of Tupperware to demonstrate and keep. Most recently, Goldsmiths fine art students Miguel Pacheco and Isaac Muñoz asked me to be part of their gallery show at the College. It was a performance assignment, but they had decided to get someone else to do the performance for them: my good self. I did a 20-minute potted party in the white gallery space, with a totally straight face, and without any concessions to the venue. I think an art critic would call it a transgressive interactive performance piece: as well as demonstrating some student-friendly Tupperware products, I drew a raffle, put a tutor in a gingham pinny as my hostess, and encouraged the international student audience to give Tupper-monials about their favourite products from their mothers' kitchens back home in Lisbon, Frankfurt, Budapest and Rio. At the end of the party, art met commerce and I took orders. Miguel and Isaac took a chance by allowing someone else to do their performance for them, but I think I did them proud. My Tupperware parties at the Vintage Festival will take place across the whole weekend of 29 to 31 July, on the ground floor of the Royal Festival Hall. Festival ticket holders only, I'm afraid, but I will also be taking a turn around the market place now and again.